Loved this hotel, they have everything you meed and very clean! Will be back! Where to find Fort Mill hotels near an airport? Where can I find hotels in Fort Mill that are near tourist attractions? Hotel and apartment choices are aplenty in Fort Mill. 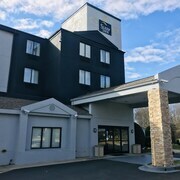 If you would like to stay within 0.1 kilometres (0.06 miles) of the heart of Fort Mill, Expedia offers no less than 36 hotel options that match that criteria. 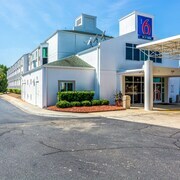 One of only a handful of hotels close to the center of Fort Mill, is the Hampton Inn And Suites Fort Mill. 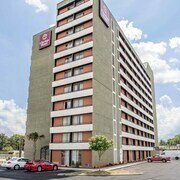 The Clarion Hotel at Carowinds is one of a small number of more economical options in Fort Mill. The The Ritz-Carlton, Charlotte is located 25 kilometres (15 miles) away from the heart of Fort Mill. Another hotel is the The Ballantyne, a Luxury Collection Hotel, Charlotte, which is positioned 10 kilometres (6 miles) away. You could also check out the rates and amenities at the Hampton Inn and Suites - SouthPark at Phillips Place or the The Westin Charlotte. Why don't you take the time to explore the many delights around South Carolina Midlands while you are in the region? South Carolina Midlands offers rolling hills, and commonly visited South Carolina Midlands sights include historic mansions and gardens. Active travelers can also try their hand at hiking here. The nearest accommodations in Rock Hill include Richburg and Red River. Richburg is 35 kilometres (22 miles) to the south of Fort Mill, while Red River is 7 kilometres (5 miles) to the south. 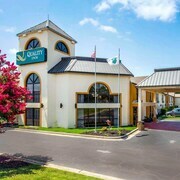 Hotels and apartments in Richburg include the Quality Inn & Suites and Econo Lodge. The Holiday Inn Rock Hill and Towneplace Suites by Marriott Rock Hill are amongst the hotels in Red River. If watching sport is what you love, head to Charlotte Motor Speedway, which is 45 kilometres (27 miles) to the northeast of Fort Mill. Those wanting to stay close by can select from the Great Wolf Lodge Concord Charlotte or the Embassy Suites Charlotte-Concord/Golf Resort & Spa. Charlotte-Douglas International Airport is a logical airport, and can be found 20 kilometres (14 miles) from Fort Mill. 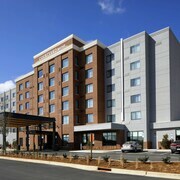 Hotels that are nearby include SpringHill Suites by Marriott Charlotte Airport and Renaissance Charlotte Suites Hotel. What are the most popular Fort Mill hotels? Are there hotels in other cities near Fort Mill? What other types of accommodations are available in Fort Mill? Explore Fort Mill with Expedia.ca’s Travel Guides to find the best flights, cars, holiday packages and more!